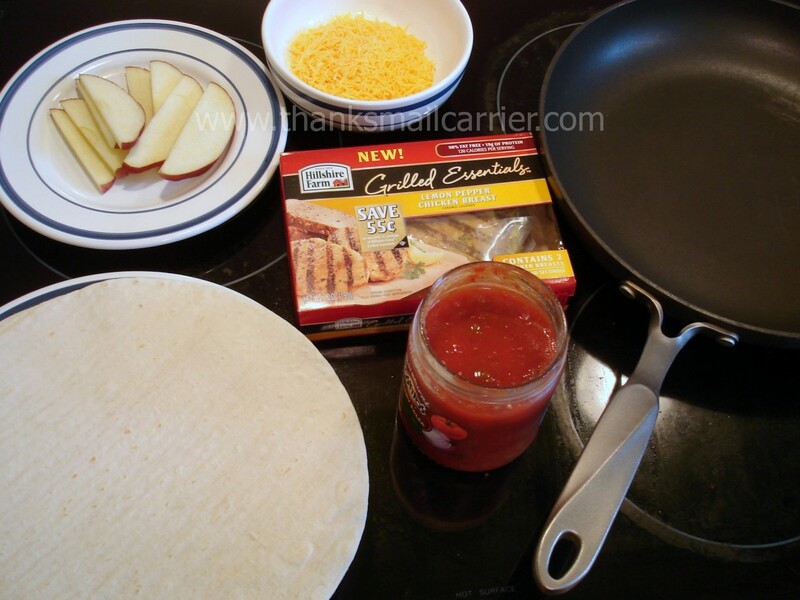 That's right, that says Chicken Apple Quesadillas. Did you just wrinkle your nose? Or have you actually tried this before? If so, why have you been keeping the deliciousness a secret from me? 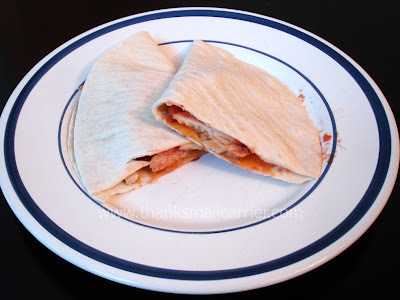 As browsing recipes is one of my new favorite indulgences, I recently came across the idea of putting apples in quesadillas on SimplyRecipes.com and I knew I had to give it a try. Plus, having been introduced to how fast and easy it is to prepare chicken with Hillshire Farm Grilled Essentials (hello! Sixty seconds in the microwave and you have great-tasting chicken breasts! ), I knew that I could pull together a way for my family to enjoy this concoction with only minutes of prep work. Heat a large skillet on medium high heat and place one tortilla in the skillet. Let it heat, flipping occasionally, until it has puffed slightly. Place cheese on half of the tortilla, being careful to not get too close to the edge. Add ¼ of the chopped Grilled Essentials chicken pieces and fold the tortilla in half. Press the folded tortilla down slightly with a spatula and lower the heat to medium. When the cheese is sufficiently melted, remove the quesadilla from the heat. Open it back up and layer on a few apple slices and salsa. Fold the quesadilla back up again, cut, and serve. Repeat with remaining tortillas and ingredients for a total of 4 quesadillas. Although my husband was especially doubtful at the result of adding the apple, that was quickly disproved by the girls digging right in! The sweet crispiness of the apple complements the traditional flavors of the quesadilla perfectly and when the only sound I hear from the table is happy munching, I know that we've found a meal that will stay in our permanent rotation. Want to see the process in action and how quick this meal truly is by using Grilled Essentials? 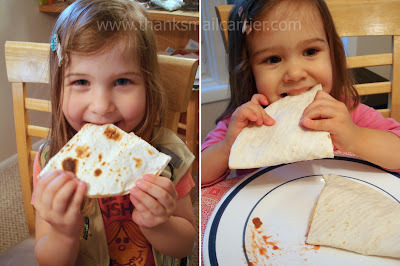 The next time you are looking for a fast, easy, kid-friendly meal, give this one a try! Disclosure: This post has been compensated as part of a social shopper insights study for Collective Bias but all thoughts and opinions are honest and my own. This actually sounds really good. Never thought of chicken with apples but do ham and apples all the time. GREAT recipe! I need to find these Hillshire Chicken! I actually love apples on my sandwiches! I do chicken breast, apple and feta cheese! YUM! I love your video! Thanks for sharing! This looks really good. I would love to make this for ME, let alone my kids. LOL!